It’s essential to be prepared for the inevitable situations that occur in our lives. The stresses involved with life tragedies can be overwhelming for us. Knowing you have a plan can bring some much needed peace of mind. Ok, let’s say you’re the forward thinking people who are going to do what it takes to be prepared. How do you track and store everything needed? 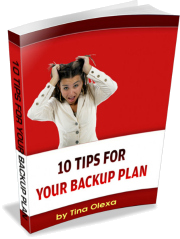 Your BackUp Plan is the answer. It’s comforting to know you or someone you love has taken the steps to ease the process of their passing. There are countless things to take care of and being protected from the stress and overwhelm can be a lifeline for those left behind. Medical emergencies, natural disasters, sudden death or unexpected tragedies can create tremendous stress. Wouldn’t it be good to know all your critical life details are organized in an easy and simple way? And instantly available in those critical moments?